The president is stepping up his travel to key states around the country one month before the midterm elections. COUNCIL BLUFFS, Iowa — President Donald Trump joked about talk of impeaching him and Supreme Court Justice Brett Kavanaugh during a campaign rally on Tuesday night. "The Democrats are even talking about doing really bad things now to Justice Kavanaugh," Trump said. "Last week, they were saying, 'We'll impeach.' ... I have to go first, right? Don't I? — even though we've done nothing wrong other than create one of the greatest economies in the history of the world." The president raised impeachment as some progressive groups are pushing forward with efforts to remove Kavanaugh. Exactly four weeks before the midterm elections that will decide whether his Republican party continues to control Congress, Trump traveled here, just east of the Missouri River, to campaign for GOP incumbents in three highly competitive House races and for Iowa Gov. Kim Reynolds. Trump appeared to be in a good mood, fresh off the confirmation of Kavanaugh, but his lightheartedness turned darker when he spoke of Democrats and the stakes of the election. "Democrats want to raise your taxes, impose socialism, dismantle law enforcement, eliminate (the Immigration and Customs Enforcement agency) and get rid of American borders," Trump said in a state where immigration is a particularly divisive topic because of the influx of laborers who support farming and other industries. "They want to turn America, these Democrats…into a giant sanctuary for criminal aliens and the MS-13 killers that we're getting out of the country by the way by the thousands," he said. "Republicans believe our country should be a sanctuary for law-abiding Americans." As he has been doing often recently on the campaign trail, Trump singled out specific Democrats for scorn — including Sens. Elizabeth Warren of Massachusetts, Cory Booker of New Jersey, Richard Blumenthal of Connecticut and Sen. Dianne Feinstein of California. At the mention of Feinstein, who is the top Democrat on the Judiciary Committee and the lawmaker whom Trump has accused of leaking to the media Christine Blasey Ford's allegation that Kavanaugh sexually assaulted her, the crowd here chanted "lock her up!" — a phrase that previously had been reserved for 2016 Democratic presidential nominee Hillary Clinton. Trump told the crowd he is "100 percent" certain that Feinstein "leaked" Ford's name, which led to the public testimony of Ford and Kavanaugh's denial of her allegation, then he backtracked to he was "99 percent" certainty, saying he didn't want to get sued. Feinstein has denied that she or her staff leaked the accusation. Trump also gave shout-outs to the local congressman, Reps. David Young, Rod Blum and Don Bacon — and slammed their opponents. 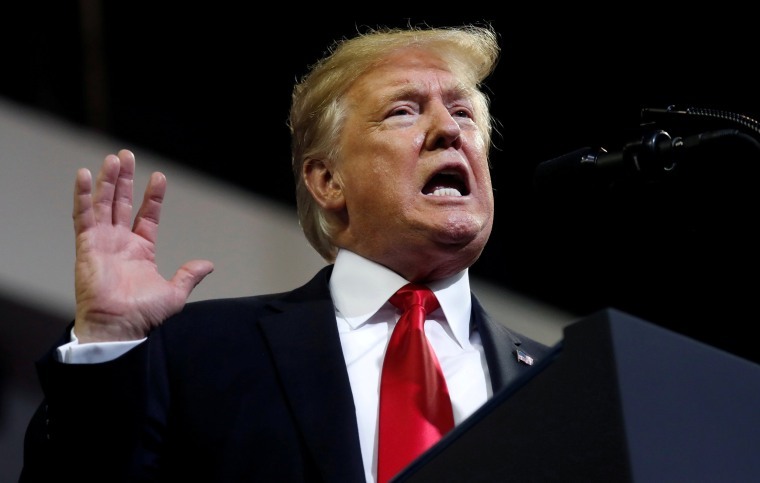 Kyle Kondik, managing editor of the University of Virginia's election-prognosticating Sabato's Crystal Ball, said that Trump's appearance here isn't likely to have much of an effect on the outcome of the three House races. "I have never been convinced that rallies and candidate events move the needle all that much," Kondik said. "The president might be able to impact races in dark red places that love him, but in these districts, all of which were close in 2016? Probably not a big deal either way." Trump also heaped praise on Rep. Steve King, R-Iowa, an immigration hard-liner who has often been criticized for statements about whites and minority groups. "I wish you could get a little bit more conservative," Trump said to King, who was in attendance at the rally. "He could be the world's most conservative human being, and I supported him long before I became a politician."